When it comes to male hair loss, hair transplantation is the only permanent way to restore your own living and growing hair. Whether it’s just a receding hairline, bald spot in the crown, a scar or injury, some thinning up top or even extensive baldness, hair transplant is usually a viable option. 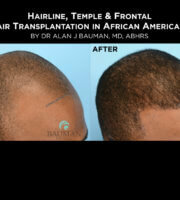 See the natural results obtained by board-certified hair transplant surgeon, Dr. Alan J. Bauman, M.D. by looking at photos before and after follicular unit transplant procedures including FUE, NeoGraft and other techniques. 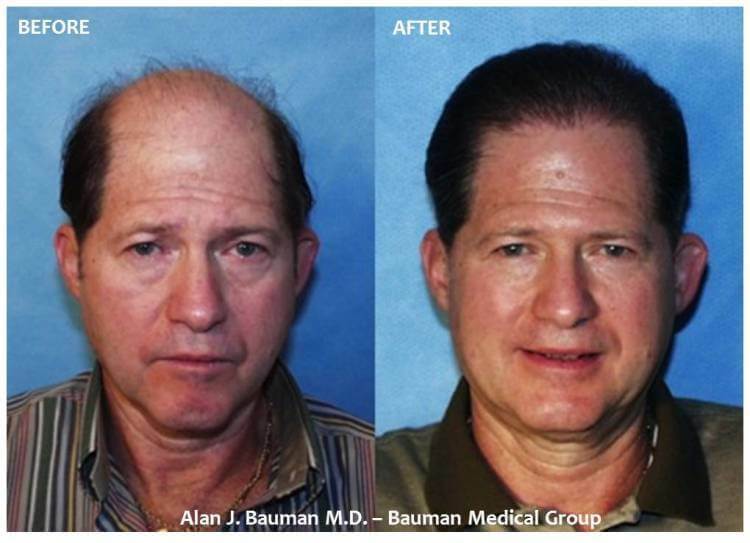 Dr. Alan Bauman is known for his experience since 1997, his hair transplant artistry and pioneering the latest techniques which is why 50% of all of Dr. Bauman’s patients travel in from out-of-town for their hair transplant procedures. Note the naturalness of the transplanted hairlines which are NOT pluggy and NOT straight. 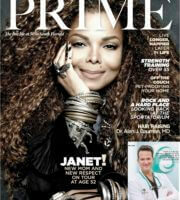 Dr. Bauman determines the angle, orientation and position of each transplanted hair follicle. Hair transplants are used to microsurgically redistribute permanent hair follicles from the back and sides of the scalp to the thinning or balding areas. The NeoGraft device allows Dr. Bauman and his team to harvest individual follicular units, as small as a single hair follicle, without using a scalpel or stitches in the donor area. NeoGraft FUE, a minimally-invasive hair transplant procedure, heals quickly with little to no discomfort and significantly less restricted downtime than old-style traditional strip-harvest or linear procedures. FUE hair transplant procedures can also be used to restore facial hair like sideburns, mustaches and beards, as well as eyebrows. Every patient is different and unique, so start a consultation today!